Joel Salatin at Polyface Farm provides the inspiration for almost every piece of the farm model. However the goal is to keep all of the livestock infrastructure mobile in hopes of expanding to rented land in the future. Therefore everything must fit on a 12 foot trailer for transportation. Unwelded edges of hardware cloth is very nasty so gloves and long sleeves/pants will prevent many many scratches. Tin snips or shears rated for 20 gauge steel cut through 19 gauge hardware cloth like scissors through construction paper. This was made apparent after a few frustrating minutes attempting to cut the material with a fence tool then large cutting pliers. Additionally, working solo required large rocks to weight down the hardware cloth whose memory of being in a tightly wound roll was apparent. Below you can see the large rock used to hold the loose end of the roll in front of the gate. Another rock was used as a chock to keep the rest of the wound material from rolling. Predation is the biggest concern through the entire lifespan of chicks here in the Shenandoah Valley of Virginia. Specifically, rats are known to carry many live chicks to their nest at a time and repeat the process every night. 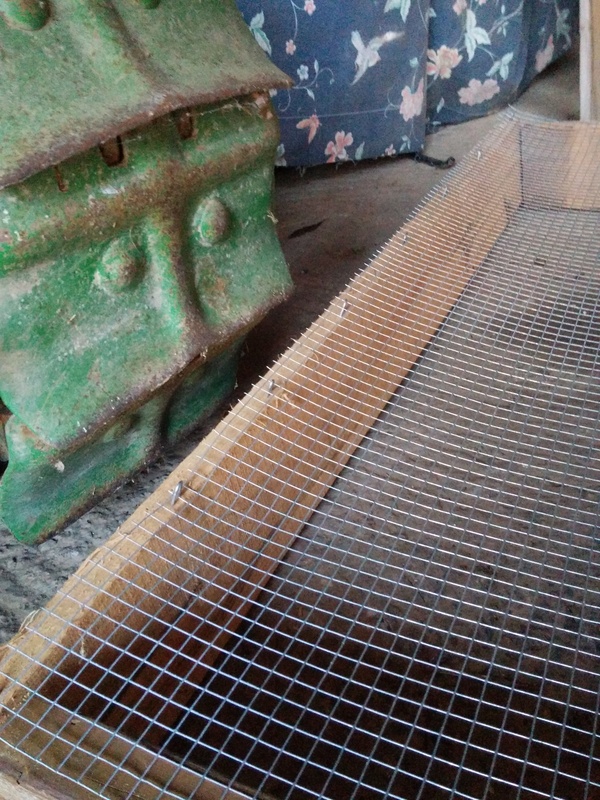 As such, the role of hardware cloth in the brooder is not to supply flooring, but to prevent access to rats. As a matter of fact mesh, wire and hardware cloth can damage a chicks feet, permanently stunting its growth. When complete, the floor shown below will be buried under about 18 inches of bedding material. I am still experimenting with the staples so I can’t give much advice. Hardware cloth has some jagged edges that love to dig in to the wood and wedge itself in the wrong position. It is a very frustrating material to work with! Letting the convex side of the mesh (in regards to the curve memory from being in a spool) sit into the wooden frame helped in a few ways: Will protect the excess material from dragging on the ground when brooder is complete and flipped over, let me stretch material with pliers if I needed a bit more to hold the staple, and it let me drive one side of staple partially in to allow a bit of play before the hardware cloth is permanently attached (Shown below). What a great tip! Staples easily go into the reclaimed, pressure treated softwood. But oak boards like the one in the picture above that have been drying since they were milled 15 years ago would not take a staple. I even had to buy ceramic plated screws with a cutting edge as my fence screws kept snapping without predrilling pilot holes. That’s the worst! We have some of that petrified type wood in the structure of our old house. Maddeningly hard to work with.